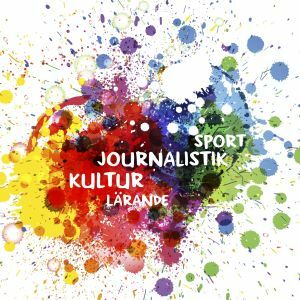 Mission: Yle strengthens Finnish society and culture. 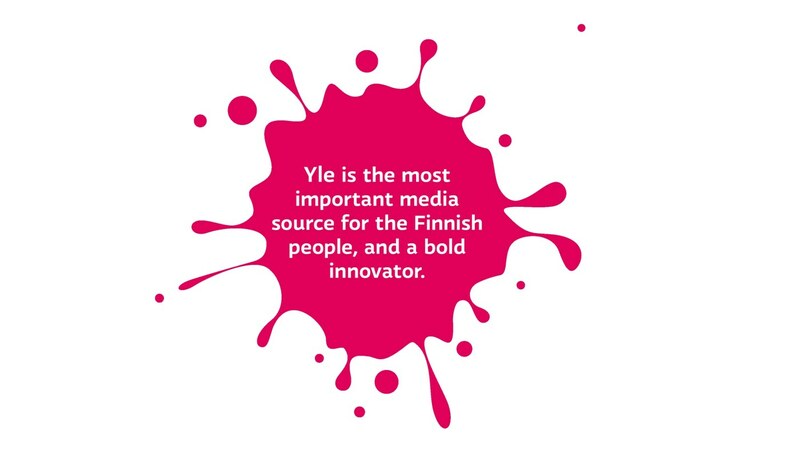 Vision: Yle is the most important media for the Finnish people, and a bold innovator. 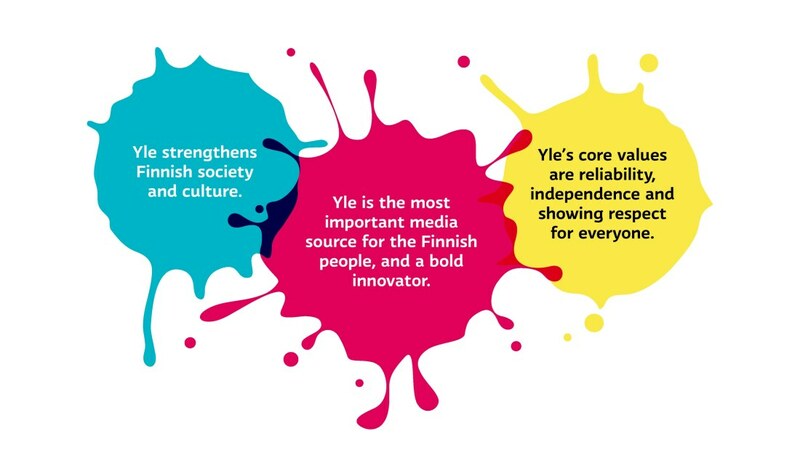 Values: Yle’s core values are reliability, independence and showing respect for everyone. Yle serves both the general audience and smaller target groups using both official languages. Strong confidence in and appreciation of Yle is based on its high-quality content, independent journalism and unwavering effort to seek the truth. Yle’s success in performing its duties is predicated on a strong relationship with the audience and extensive reach. The digital and societal transformations are creating a completely new landscape for Yle. Technology is continuously revolutionising services and everyday life. More and more content is becoming available for everyone. At the same time, the values, lifestyles and culture of Finnish citizens are becoming fragmented. A limitless, global supply of media and countless services are competing for people’s time and attention. The use of media is particularly fragmented among young people: they seek information and experiences in numerous services. Amid growing supply, Yle must have the skills to retain its connections with various target audiences. Choices are no longer based on the availability of media, but on which outlet is able to provide the most valuable content and the most personalised user experience. Enhancing the importance of public services in the everyday lives of different people. Continuing to protect journalistic independence. Investing in personal user experience, and different information and experience needs. Increasing openness and dialogue among all Finns (contributing to reliability, particularly as commonly held truths are being questioned). Continuing to build internal trust and a new form of working culture. As a public service company, Yle contributes to stability and continuity. Finland needs shared experiences, mutual understanding and reliable information. At the same time, Yle must make sure that changes in society are both seen and heard through its content. A functioning society is based on trust and mutual understanding. Democracy must be allowed to thrive by providing a public forum for different opinions, public discussions, and shared experiences. Yle creates shared space through both journalism and cultural content. Yle provides media content and experiences that cater to the interests of different generations of audience. Yle produces content that reflects the diversity of Finnish society. Yle amplifies its presence among Finns, promoting the everyday lives of different people, communities and language groups through content that reflects them, their experiences and their sphere of life. Yle highlights a wide range of cultural phenomena, facilitating the cultivation of a distinctive culture. Yle makes culture available for everyone. Yle develops new forms of interaction that promote the inclusion of people in discourse, development and working together. In this mission, Yle adopts an agile approach to opportunities provided by new technology. Yle improves the user-friendliness and clarity of its services, with particular emphasis on ensuring access to online services. Yle continues the development of its sign language services. Yle helps users of all ages improve their digital skills. By providing wide-ranging, comprehensive content, Yle ensures that everyone has access to varied, interesting and high-quality content. Yle operates appropriately in both broadcast and network environments, making sure that content and services are available exactly where people are looking to access them. Yle emphasises quality, in-depth, meaningful journalism, continuously developing its journalistic knowledge. Yle promotes the discoverability of its content, investing in improving the personal user experience. Yle continues to develop online services, such as Yle Areena, news and children’s services, making the user experience even easier and smoother. Yle will complete the transition to high-definition broadcasting in 2020. 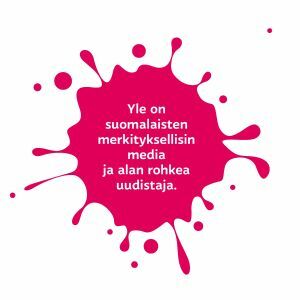 In online publication, Yle will utilise third-party platforms as necessary. Yle allows space for young voices and thoughts, while renewing its services directed at youth audiences. Yle reports on world events from near and far in an understandable way, while promoting Finland to the world. Yle provides reliable, in-depth information and touching stories for viewers to reflect on their own lives and the world. Yle renews its audio services, taking radio broadcasting online. Online audio content is developed in order to adapt to new applications. Extensive reach, presence and significance of radio content in the everyday lives of various audiences is ensured while renewing FM channel service profiles. Yle renews its regional operations in order to be present and closer to people’s everyday lives, so as to better describe Finland and establish a more influential and flexible presence in distribution channels, both regionally and nationally. Ever-changing working and operating environments require new skills, the boldness to experiment and the readiness to let go of old ways. Positive management that supports reinvention is essential for success. Yle retains its place globally as a leading example of a public service media house and the utilisation of technology. Yle employs an agile approach to developing content and services, as well as technological solutions, methods and facilities that support this approach. 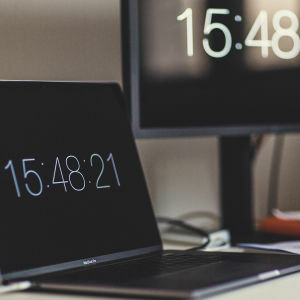 With experiments and innovations, Yle ensures that it utilises up-to-date tools for producing quality content, as well as flexible ways of sharing such content. Yle makes use of new technologies, such as virtual reality and artificial intelligence, in developing its services. 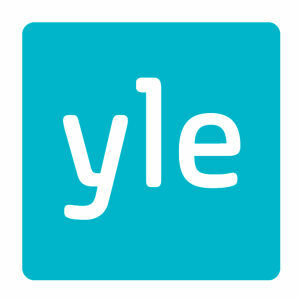 In the coming years, Yle will be allocating 15–20 per cent of the company’s resources to new areas of emphasis, including content designed for youth and young adults, as well as online development. 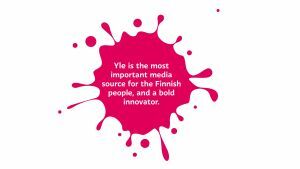 Yle supports renewal through an open, flexible and agile working culture and by reinventing its leadership. Yle actively develops in-house skills while maintaining the ability to find the best talent on the market. Yle enhances the multifaceted, demanding professional skills of its employees in order to meet the challenges posed by the ever-evolving media industry. Yle promotes the diversity and vitality of Finnish media and the creative sector. Through procurement and collaboration, Yle improves employment in, and the quality and skills of, the domestic media sector. 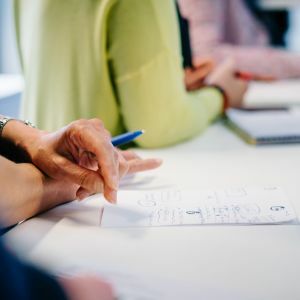 Yle meets the future challenges of digitalisation by taking care of improving the skills of its employees and by investing in management that encourages participation, as well as well-being. Yle will increase programme purchases and acquisition of production services from external sources by 30–35 per cent by 2022. Yle will focus collaboration efforts towards companies within the creative industries, while increasing collaboration with commercial media. As regards technological solutions, Yle will continue to acquire services, systematically increasing acquisitions of third-party services. Yle will continue to develop its procurement skills. Yle ensures smoothness, cost-effectiveness and financial prudence in all aspects of its operations. Yle is a responsible employer and partner. Yle will increase its financial and operational flexibility and use the funds allocated to it in an effective and transparent way. Yle's finances will remain in balance. Yle strengthens Finnish society by providing everyone with information, education, insights and experiences. According to the Act on Yleisradio Oy, the company is to provide versatile and comprehensive public service content for all citizens. These services may be provided in public communication networks nationally and regionally. Yle uses both of the country’s two official languages, while also providing services to the Sami people, as well as other minorities and special groups. The comprehensive public service mission bestowed on the company allows Yle to support a diverse society and promote the equal participation of various population groups in public life and discourse. Yle is a politically and financially independent broadcaster. Yle promotes freedom of expression, high-quality journalism and versatility of the media. Yle’s mission is also to support the preservation of Finnish cultural heritage, tolerance, equality and cultural diversity. Yle offers a platform for all people, treating everyone with respect. 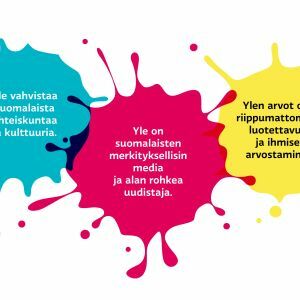 Yle makes culture and experiences available to everyone, including people who do not have the possibility to participate in events. Everyone should have the opportunity to learn. Yle promotes equality by making its content and services available to everybody, regardless of their financial standing or place of residence. Public service media providing information, culture and experiences is an investment in a common future. The strategy approved by the Administrative Council provides Yle with guidelines for the near future. The strategy ensures that Yle’s operations are sustainable and systematic. This also requires that Yle keeps boldly renewing itself in order to keep pace with the rapidly evolving operating environment, use of media and technological developments. 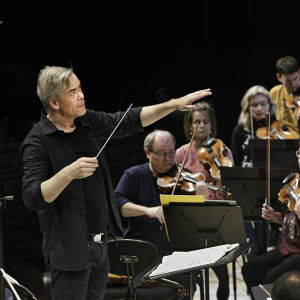 Yle must have the skills and tools to operate in the current radio and television broadcasting environment, as well as in new content and service areas. Ensuring public trust in Yle is essential for the implementation of public service broadcasting duties. Administrative Council approved Yle's strategy in its meeting 24th of October 2017. Hallintoneuvosto hyväksyi Ylen uuden strategian 24.10.2017. Yle siirtää merkittävän osan resursseistaan uusille painopistealueille ja lisää myös ohjelmahankintoja ja palveluostoja. Hallintoneuvosto hyväksyi Ylen uuden strategian 24.10.2017. Yle vahvistaa suomalaista yhteiskuntaa ja kulttuuria. Yles strategiska mål fram till år 2020. 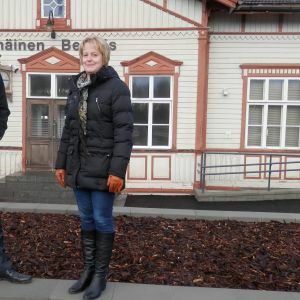 Strategin Mitt bland oss drar upp riktlinjerna för Yles verksamhet fram till 2020. Vart är Pedersöre på väg? Arbetet med den strategiska generalplanen är inne på slutrakan i Pedersöre. I planen som beskrivs som unik i Österbotten i sin omfattning skissas på kommunens framtid och vision inför 2030. Kommunerna i Vasaregionen får en gemensam strategi för markanvändning. 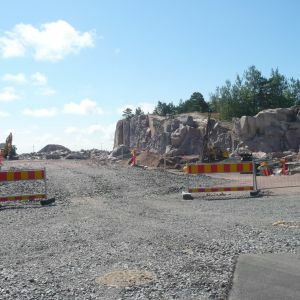 Målet är att skapa en gemensam vision för till exempel boende, trafik och tjänster.